Thirteen years after the September 11th terrorist attacks in New York City, thousands of first responders continue to struggle with health problems, some which are just being diagnosed. Respiratory illnesses like asthma and sinusitis are common among those who participated in the World Trade Center recovery efforts. And studies show that the incidence of cancers for 9/11 first responders are 15 percent higher than the general population.Thyroid cancer was 239 percent higher. John Feal was severely injured on the Ground Zero site when an 8,000 pound steel beam crushed his foot. He started the FealGood Foundation, which advocates for physically and emotionally injured first responders and helps them get compensation. 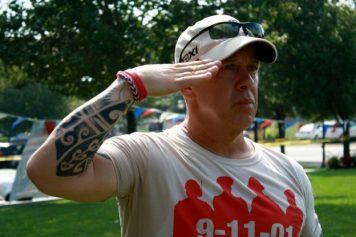 Feal tells Here &Now’s Jeremy Hobson that he believes post-traumatic stress disorder is the number one killer of 9/11 responders. “My injury pales in comparison to those who are sick and dying — or who have died from their 9/11-related illness. These invisible diseases are literally killing these men and women on a daily basis, and sadly 2,749 innocent lives were killed on 9/11, because of senseless violence but we’re losing people all the time. “When we got the bill passed December 22, 2010, the first words out of my mouth were, ‘This bill is not perfect.’ On a scale from one to ten I’ll give it a six. But a six is better than nothing and that six is helping people. Yesterday, we just introduced legislation to extend this bill 25 more years. This six can go to a seven or an eight if we can get this done.